Winston Churchill was enjoying a family Christmas Eve—which included the gift of a Christmas tree from President Roosevelt—when, after reading the last of the day’s telegrams, the Prime Minister realized that the situation in Greece required his urgent attention. This week in the war on 25 December, Christmas Day 1944, Winston Churchill flew into Kalamaki airfield near Athens, after a brief refueling stop in Naples. 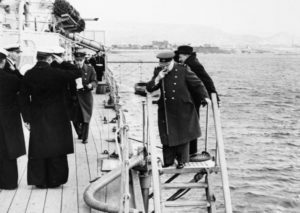 Churchill and his delegation spent the night on board the British cruiser HMS Ajax (of Battle of the River Plate fame), which was anchored in Piraeus harbor. Archbishop Damaskinos, of the Greek Orthodox Church, came on board to discuss the threat of an armed Communist takeover in Greece—a threat which had prompted Churchill’s dramatic flight from England in the middle of winter. The following day, the Communists (notably ELAS–the Greek People’s Liberation Army) were invited to a conference at the Greek Foreign Office in Athens. It was agreed that the King of Greece would be asked to appoint the Archbishop as Regent, with the understanding that Damaskinos would form a new government for the country. This entry was posted in World War II and tagged Archbishop Damaskinos, Athens, Christmas 1944, Churchill, ELAS, Greece. Bookmark the permalink.